Welcome to Sounds of Europe, a platform for field recording. The blog of the website will travel to a different European country every month where a local organisation or artist will be responsible for maintaining it. Each country´s particular context and practices with regards to field recording will be explored and presented in a personal way. 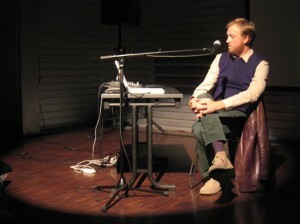 There is probably a reason if innovative practices of sound art such as field recording have been (at least in France) mostly growing outside of the institution: it had to come from people regarding techniques and practices not as something to be afraid of or to be inhibited by, but as an open range of means for experimentation and invention to play with. With his generosity in sharing the pleasure of experimenting and finding ways for revealing unexpected sonic phenomena, Manu his giving a pretty good example. — You have been making music for a long time, but when, and how did you get into working with sounds recordings? Were you able to do that as a student of the Art School in Grenoble or was it something you had to experiment with in the margin? Then there has been a short and rather wild period making very noisy things with Sébastien Borgo, around 1992-1994. Tens of thousands of effect pedals, crummy guitars and crummy amplifiers with which to enact the end of times… We were also using taped sounds, sometime using the tiny control speaker on the recorder to play the sounds through the guitar’s microphones. Any small anecdotal sound would be monstrously amplified and transformed. It became quite nice with the colossal sound! So I’d already been around that sound thing for a little while when I got into Art school. After that I discovered the beauty of tuned strings, and for a while electric guitar was my main source of sound production. I was using very little effect if any, and it would actually sound like something. When I presented this work for the first time in Art school it was already standing on its own feet. I had this limited edition cassette of my guitar stuff released, with the blessing of some American friends who had been playing a couple copies around in the USA. That got this obscure home-made cassette a very nice review in Bananafish, which got me off my rockers at the time! This was 1994, it was thirty copies at the most and I was nobody…! In about 1997, walking around in the city, I heard this magnificent sound in the midst of one of the main square in Grenoble. Searching around, I realized that it was coming from the faulty air shaft of some fast-food stand, producing an incredible and enchanting flute-like chord. It was around 8:30 in the morning, I knew there was a decent Marantz recorder and a Sennheiser microphone at the Art school, so I rushed to get it! This how I made my first proper sound recording, with what I would call a musical intention… During the afternoon, I played it back: it was completely distorted, lousy. When I got back, the air vent had been fixed, and the flute chord had disappear for good… But I had liked it. That was the trigger. In the same week I went recording the power transformer of the swimming pool that was in between my place and the 102 – the alternative venue where we were organizing concerts. I was walking that way almost every day, an I used to like singing along with the transformer. I was playing with the vibration as I walked by, getting in and of tune. I liked the physical feeling. The fact that recorded this transformer was actually the founding act of the work I’m still doing today using sound recordings, this is how it all started. That time the recording was very meticulous. I composed an electroacoustic piece, ‘Mercure‘, using sine curves from a mount kit LF generator, a toy melodica and that recording. It was a very minimal piece of about 10 minutes, all acoustic phenomena: beats, harmonics, moving panners, etc… I played it to Éliane Radigue who happened to be incredibly supportive… That was a good start, which was a little unexpected, but after that it took years for me to really get into it. — Your work with sounds was more self-taught than anything, but would you say the Art school background had an influence on your relation to sounds? Or, to say it in dirty words: what was your relation to the ‘plasticity’ of the sound ‘medium’? Of course, going through Art school had its importance, even though my sound adventures were already well under way. Having to legitimate a sound practice in a plastic arts school was a constant concern. Half of my teachers were supporting my research, but the other half was thinking I had nothing to do there, saying I should go to IRCAM! I constantly had to prove that sound was indeed a material and that it made sense and was valid to consider it from a plastic perspective. The history of Music is only one aspect of what is possible, there is so much non directly music-related things to be done with sounds. This was the time when I started giving lectures about Sound Arts… to educate my ignorant teachers! Also, at the time, I was mingling with guys like Lionel Marchetti or Jerôme Noettinger, who have taught me a lot as well. — As far as academic practices go (such as sound documentary, audio-naturalism, sound engineering, and so on) one would always refer to the proper and not proper things to do, to the good and the bad equipment… But what is it like in the case of a non-academic practice like your own, are there influences and references providing for a theoretical grid, organizing and legitimating the practice? DIY, circuit-bending and the aesthetics of recycling can be such philosophies… Are you claiming for something like that, or is it essentially about saying that you started without much and that it is possible? Well, for years I’ve been living without much and I had to pull it off like that. When I started making sound recordings I was amazed by the recommendations I was given… People from the underground music world were swearing I should use this or that device, of which the price would compare to that of of a car! It sounded insane to me: the same people that were making radical political statements against consumer society would only rely on exorbitantly priced equipment… Of course, high-end equipment has its benefits and I would be happy to enjoy them, but if I had to wait before I could afford a Nagra, Schoeps or Neumann microphones, I wouldn’t have achieved anything. As a matter of fact, I’ve been working a lot with cheap or home-made equipment. So, proper or not, good or bad tools, even DIY… I’m not claiming for anything, but I do try to do with what I have and do it the best I can. This is a simple matter of economics of crisis and necessity. I like to have a beautiful, ample and rich sound, and it seems to me that working coherently, knowing the limits of the equipment you own and combining all the techniques you know makes it possible to get a homogenous and satisfying result. — What form of knowledge would one develop outside of the academic practice? A singular practice with its ‘tricks’, a composite practice with its borrowings? Of course, having to do it on your own leads to a certain form of singularity. With a little ingenuity you might discover surprising things that you wouldn’t have encounter through the orthodox ways. Having to work in a technical environment that is relatively limited, composite and rudimentary, calls for some working discipline and comes with a lot of constraints. It makes it necessary to explore and know about the means at your disposal, and this takes time. It took me about ten years to feel relatively confident with my composition or recordings. The idea of constraint might sound like an inconvenience, but curiously enough it is inside such a frame I’m working the best. If I had a professional studio, with a complete range of microphones and processors, I think I would spend all my time fiddling around, touching everything, being unable to focus on one task. This probably has a determining influence on the quality of my sound as well, on its singularity and the fact that it won’t sound like any other. The other thing is that I’m only using the computer for montage, all my sounds already have their color and texture, their intensity, their expressivity by the time they are captured. I am using very little or no electronic processing at all, sometimes a hint of reverberation, a little filtering or de-noising tools, which are very practical to smooth out background noise in some cases. In my music, all sounds come from rather ‘real’ phenomena (if that means anything and makes any sense, because I believe that anything that is recorded is already taken very far away from its source…), and I think it makes possible a density, a richness in textures, a life, even, which I wouldn’t be able to generate by artificial means. But this is another topic… a big one, actually. — You are an instrumentalist (with DIY tendencies) for a very long time, and about your work with field recordings I heard you use the term of ‘microphony‘. Would you say that your are using the microphone as an instrument? What would that mean, practically speaking: being an instrument maker as well as an interpret? Since I’ve started working with sounds, I’ve been trying everything. I love been eclectic and I don’t rely on any precise codification, I like things sounding different too much for that. I can be as enthusiast creating sound spaces with mutant speakers as I would be playing ‘Les Verres Enharmoniques‘ [glass rubbing instrument Manu conceived and with which is performing with Sophie Durand - TN] or making turmoils of frequencies in a rock band. About ‘microphony’, this is a word I’m using because I don’t like the term ‘phonography’. It seems to me that ‘phonography’ emphasizes on fixating sound (with a syntactic connotation that bothers me), while I’m more interested in using different types of microphones. There is something there to pay with, while capturing sounds, like you would play an instrument. I’m already composing as I am recording sounds and as I choose this or that microphone to confront with a given event. What really interests me is this play that comes with the recording, rather than any kind of ‘-graphy’… But maybe this is only quibbling. Apart from that, I am very sensitive to specific sonic phenomena: harmonics, resonances, patterns, and most of the time, those are ‘found objects’. So what you have to do is creating the auspicious conditions, working at finding them. All my work results from this sensibility, and when using any kind of tool, I want it to help me revealing these phenomena. So I adapt myself or I adapt the tool. When working with instruments, as I don’t know my sol-fa and never learn to play anything properly, I had to come up with my own techniques, and sometimes even my own instruments. In the long term it has brought me into creating a specific langage, which is sort of my own… which anyway is certainly not academic! — You are listening, you have always been listening to a lot of music. How does your culture as a music fan affects your work, especially the electroacoustic and environmental aspects of it? 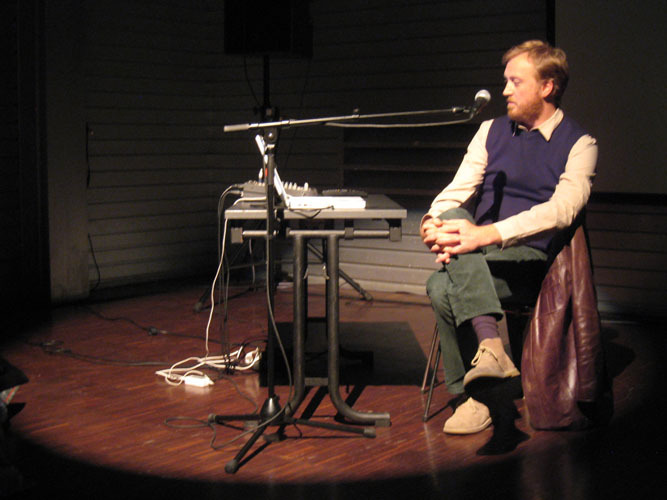 One might feel that emerging forms of sound art and field recording sometimes tend to free themselves from musical references, and connect with documentary forms or audio-naturalism, rather. So, the question is: how all this weird obscure rock stuff you’ve been listening listening affects you ear when listening to a frog? Wow! The question of influences, don’t even get me started! I have this tendency of considering myself a music fan more than a composer, anyway. This is also why I’m not publishing a lot. I am only willing to have something released when I’m sure that it reflects something that is really mine, even if this ‘mine’ is a crystallization of many influences. Also, I have to say it again: I don’t consider myself a field recording artist or anything… I am just using various techniques according to what I need and, first of all, according to the pleasure I can get from it. Pleasure is the main thing for everything that I’m doing: playing records, listening to frogs, going to a concert or listening to the city… all accordingly. The other night we were listening to a record by Jean C. Roché with Sophie, some recordings of birds and frogs in the tropical forest of Venezuela made in the 70′s. Some parts really sound composed, like something Rolf Julius would do. the fact that a natural thing can have so much in common with an artificial one, and vice versa, is really magical. Everything holds together, what would seem disparate is actually part of the same ‘Ocean of sounds‘, to quote David Toop.